The Albany-Colonie Yankees needed two wins for their second-consecutive Eastern League championship in September 1989 and Rodney Imes helped pitch them to the first of those with a complete-game, three-hitter. "I didn't really feel any pressure, but I knew inside what was at stake," Imes told The Schenectady Gazette after the 6-1 win. "It felt like another start." Imes' A-C Yankees would go on to win that Eastern League title and Imes would go on to feel the pressure of AAA the next season. But he would never feel that pressure in the majors, his career ending after 1992 and six seasons in the minors. Imes' career began in 1987, taken by the Yankees in the 16th round of the draft out of Old Dominion. He started that season at short-season Oneonta, going 4-0, going 27.2 innings and giving up just one earned run. His ERA was 0.33. Jumping to high-A Prince William, Imes went 2-3 with a more realistic 3.95 ERA. 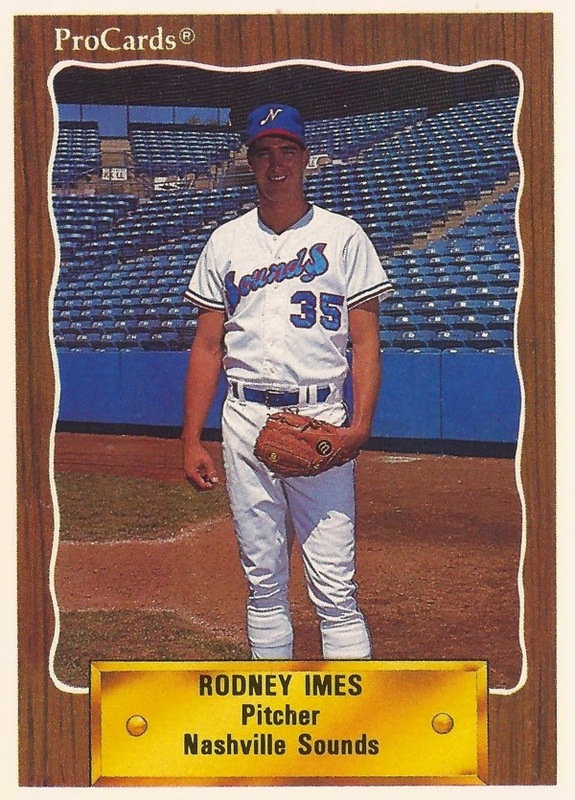 For 1988, Imes went 14-8 with a 3.13 ERA over three levels, at Prince William, Fort Lauderdale and Albany. That August, Imes went 8.2 innings, giving up nine hits and one earned run. Aris Tirado finished for the save. "You always like to finish, but 'Ace' came in with a fresh arm," Imes told The Gazette. "It's not that important, because the ballclub won." Imes' 1989 season was even better, going 17-6, with a 2.73 ERA. That December, the Yankees sent Imes and Hal Morris to the Reds in a four-player deal. Imes stayed in the Reds system for the next three seasons. He played at AAA Nashville for 1990, going 10-8, with a 3.71 ERA. He split 1991 between Nashville and AA Chattanooga. For 1992, Imes' final professional season, he spent the year back at AA, at Chattanooga. Back in 1987, playing for Prince William, Imes had the misfortune to be on the mound twice when the stadium power went off once and three transformers blew another time. These days, Imes appears to be working in the power industry, fixing such problems with Allegheny Power. Imes was also inducted last year into the Allegheny High School Hall of Fame.